Hawaii. Business or pleasure? Because it was business for John, I horned in on the gig to cover the hotel expense and made it my vacation. And despite being extensively mosquito bitten, sun rashed, and chilled to the bone on a catamaran cruise, it was my pleasure. His first conference was on Oahu and accommodations were in Waikiki. A beautiful beach but the resort there is a bit over-packaged and crowded (a.k.a. touristy – beautiful beaches surrounded by a density of highrises just doesn’t take you “there”). I was eager to explore the island and so when the conference was over, we rented a car and drove all over the place. Highlights, thanks to the valued advice from my comrade from Oahu, include Manoa Falls and the Diamond Head farmers market where we grabbed lunch: kalua pork sliders (OMG! BFF!) – juicy kalua pork with cabbage on a taro roll. Unforgettable. I wish I (porked out) ate 2 more, but we got to the market late and they were closing down. From there, we were (fortunately) thwarted from taking a hike of Diamond Head (parking was full) and so headed out to Manoa Falls (as it turns out, a significant upgrade of plans). The trek to Manoa Falls is a muddy, slippery climb – even before the light rain shower we later experienced – through lush tropical forest that terminates at a waterfall. If you ever get the chance to take this hike, be prepared to be dabbled with mud and mosquito bites (although John didn’t get any…?) and be thankful you’re not one of the number of bozos you cross paths with who think flip-flops will serve the trek sufficiently. On to the island of Kauai where I horned in on the accommodations of a second conference. I planned my visit to maximize the time on Kauai because I suspected it would be less crowded. When I got there, it seemed desolate. Our resort was 5 minutes away from the airport and there were chickens at the airport, along the roadside and at the resort. I wondered and worried just what I had signed up for and what I would do for the next few days. I felt cut off. So while John attended his conference, I was determined to find the best beach. I took to our rented PT Cruiser (white and super-fun to drive in Kauai) and Kauai’s 2-lane highway that belts around the island driving through charming towns with their roadside chickens, and through side roads to find just the right beach: not rocky, not scraggly with seaweed, with clear water and warm, soft waves. Meanwhile, my beach shopping was interrupted by one of John’s elective conference activities: a catamaran cruise up the Na Pali coast. It was the first time I’ve been out on the ocean and I delighted in the sun and its reflection off the water, the “desert” surround of the ocean and its waves and the bounce and splash of the boat as we raced up the coast. We even caught up with a herd of spinning dolphins and everyone amazed at their presence and their spinning jumps and dancing swim. But on Kauai it rains, somewhere, everyday. And that’s where we were headed. My clothes got damp from the splash of the waves but then, as we headed under grey clouds, I became soaked from the rain and then chilled from the winds. I stayed on deck, despite the chilling cold, to take in the amazing scenery: shock-scale, storybook cliffs draped high by gray, gossamer clouds and skirted low, by diminutive, but powerful ocean waves. When we were past the mesmerizing scenery, the “cruise” became interminable. I was shivering, John became seasick, and all I could focus on in those moments is that not only would the cruise have to end (in the then-distant future) but I would even be back home in LA at some point (sigh). But even now, here, from the comfort of my home I can tell you: although the cruise offered some worthy vistas, it was still too long. Back to the beaches. John was done with the conference and I could almost surgical-strike our idyllic beach hang out – I just needed to inventory a couple more spots on the north shore one of which was Ke’e – that was still too rocky and crowded – although we found an ocean cave there to check out. Our prize beach was between Black Pot and Ke’e. And so I changed into my swimwear, took to the waves – pausing to wait for a school of silvery, minnow-sized fish to swim by – and let the warm, turquoise waves envelope me. Growing up in the boonies (in the foothills past the last dirt road) of Albuquerque I longed for the city. And now that I’m in the big city, I’m enamored with Kauai because it reminds me of the back road to Santa Fe and it’s small old towns remind me of Madrid (that’s ‘MAD-rid, NM; mah-‘DRID is in Spain) along the way to Santa Fe. 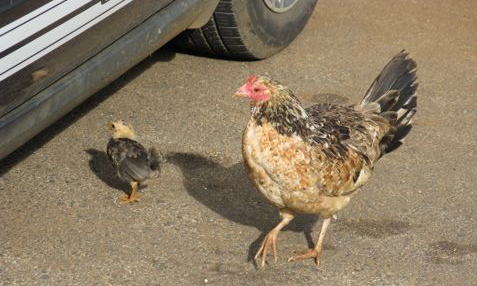 In Kauai that age-old question becomes a koan: why did the chicken cross the road? to remind you you’re on vacation.